We will shortly be publishing our new forecast for the 2015 General Election. It will be very different from previous forecasts where we have indicated a clear Conservative lead. Our previous forecasts have been based on the assumption that the movement in Conservative, Labour and Liberal Democrat votes will be similar to that seen in previous elections. With over two months of the final six months of the election campaign now behind us, we can analyse the movement in polling support for the three main parties to assess if they are moving in the manner expected. What Analysis Have You Done? The charts below show the movement over the past eight months of the three main parties compared to the average for the past five election. From these charts you can see how the parties are faring comparing to their normal behaviour. 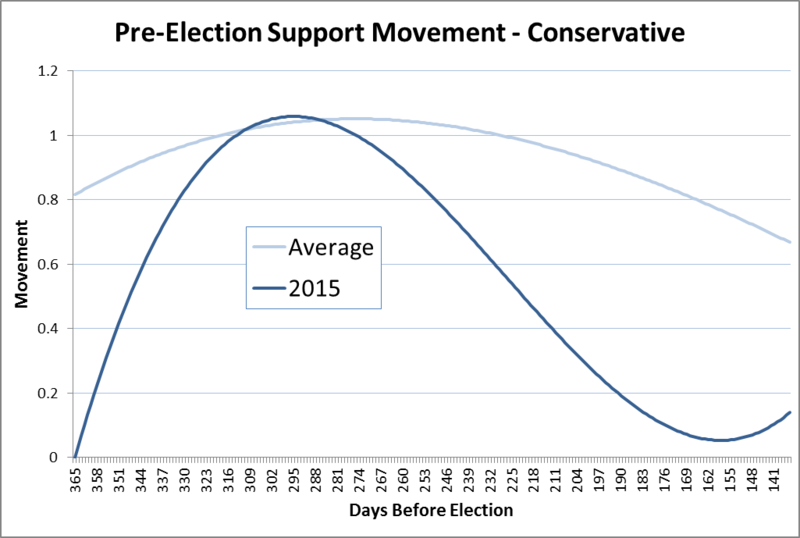 CC Comparing the shape of the curves over the 200 day period indicates whether the movement is similar in form to previous elections. 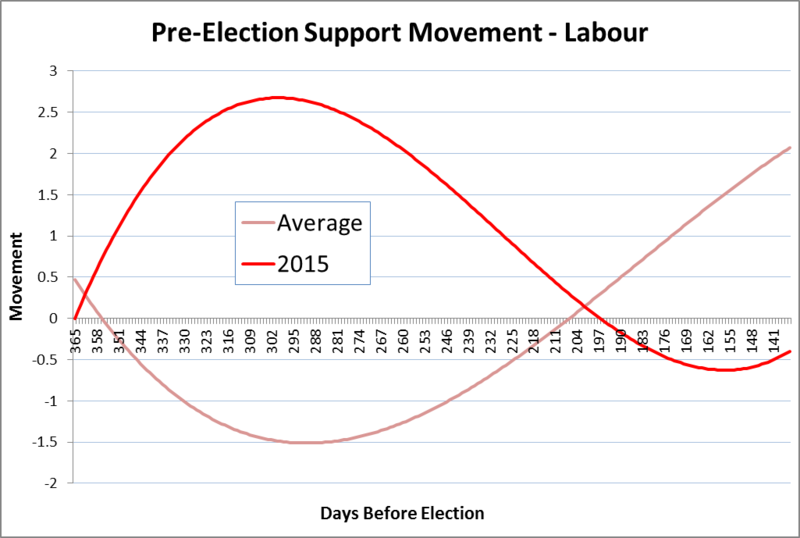 Comparing the height of the curve indicates whether the effect of the movement is the same as previous elections. 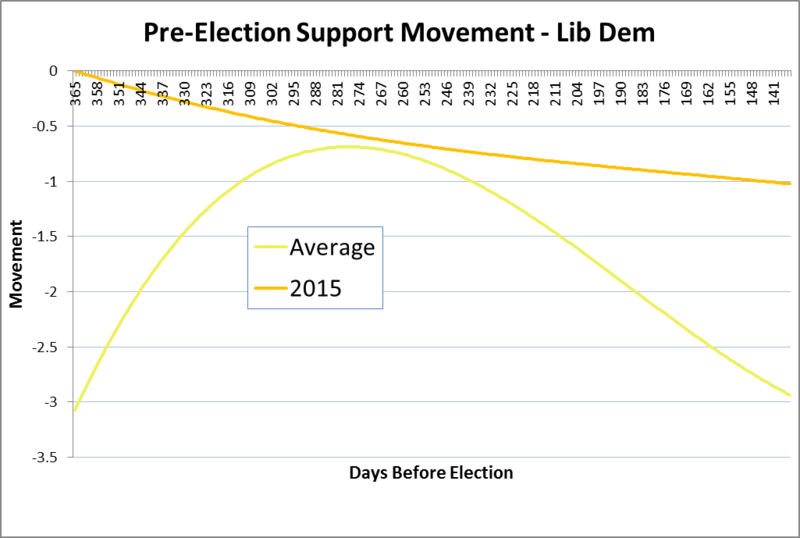 We can see from the analysis that the movement of Labour and Liberal Democrat support in the last few months is very different from previous elections, We can see that the movement of support for the Conservatives is similar to, but not identical to previous elections. What Impact Will This Have On Your Forecast? Our forecasts so far have been based on assuming the average movement before elections. Now we have a large amount of data on polling from the past few months we can make adjustments to those assumptions to more accurately reflect where we believe the movement in support will go in the next four months. Our next forecast will reflect this updating of assumptions. We have used analysis on polling data, by-election data and other sources to produce new estimated movement assumptions for each party. As new polling data becomes available, we will continue to update the assumptions, affecting new forecasts.